Area Navigation (RNAV) is a navigation technique that allows pilots to navigate directly between any two points on the globe. Using RNAV, any location on the map can be defined in terms of latitude and longitude and characterized as a waypoint. Onboard RNAV equipment can determine the present position of the aircraft. Using this positional information, the equipment can calculate the bearing and distance to or from any waypoint and permit navigation directly between any two waypoints. In this way, RNAV overcomes a fundamental limitation of conventional navaid point-to-point navigation techniques, which require navigating between electronic navigation transmitters on the ground. The following examples illustrate this limitation. An aircraft equipped with conventional VOR receivers is positioned at Point A as shown in the diagram at the top of Figure 3-1, and the pilot wishes to navigate directly to Point B. Although there appear to be a few VOR stations in the vicinity of the aircraft, it is not clear whether reception is possible from the aircraft’s present position. If the VOR stations are within reception range, the pilot has two choices: (1) fly to intercept the closest airway, then track it to the intersection; or (2) fly to intercept an extension of the radial that defines Point B (assuming reception is possible). Neither alternative provides the pilot with a means of flying directly to the intersection. 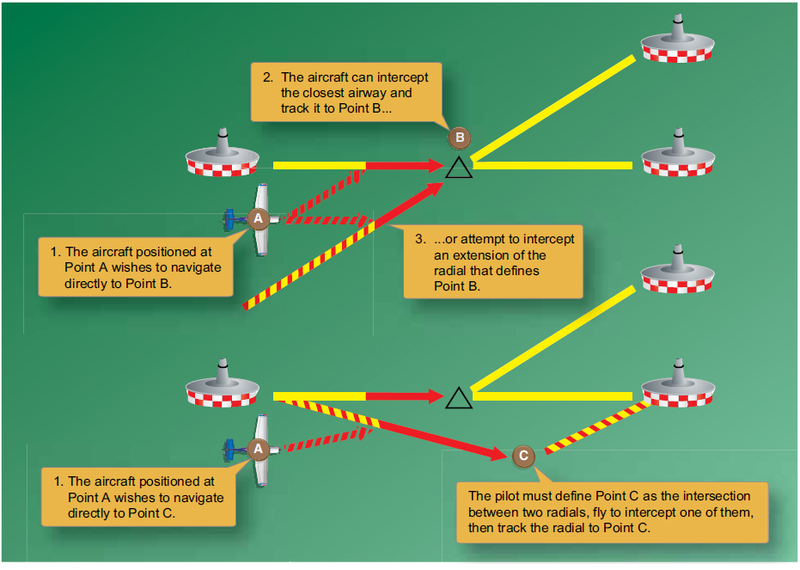 Suppose the same aircraft is positioned at Point A as shown at the bottom of Figure 3-1 and the pilot wishes to navigate directly to Point C, which is neither a VOR station nor airway intersection. This pilot has an even more difficult situation. Assuming the VOR stations are within reception range, the pilot needs to create two makeshift airways using a navigation plotter and chart, fly to intercept one of them, then track to Point C (which the pilot has defined as the intersection between the two courses). Flying a direct course to Point C with any degree of accuracy is not possible. Since RNAV systems are not bound by these limitations, the entire airspace is available for navigational use. The national airspace system can thus accommodate more aircraft. However, when the pilot leaves the established airways, he or she also leaves the guaranteed obstruction clearances designed into the airway system. Always plan flights above the maximum elevation figure (MEF) displayed on sectional charts when flying off airways, and be aware that manmade obstructions such as towers may not be added to charts for some time after construction. If flying a new routing, allow for construction, which may not be published yet. RNAV is possible through use of a variety of navigation facilities and installed aircraft equipment operated in the U.S. National Airspace System. This handbook focuses on the more common GPS RNAV, a satellite-based radio navigation system available to aircraft equipped with a GPS receiver. In addition to its ability to receive signals from GPS satellites, a GPS receiver also contains a computer processor and a navigation database that includes much of the information found on en route and terminal procedure charts. The newer, more capable units provide map displays, traffic and weather overlays of data, contain VOR/DME/localizer/ glideslope receivers, and can compute fuel usage in addition to the navigation route information. For this reason, the more descriptive term “FMS” is used in this handbook to refer to these GPS receivers. An FMS allows you to enter a series of waypoints and instrument procedures that define a flight route. If these waypoints and procedures are included in the navigation database, the computer calculates the distances and courses between all waypoints in the route. During flight, the FMS provides precise guidance between each pair of waypoints in the route, along with real-time information about aircraft course, groundspeed, distance, estimated time between waypoints, fuel consumed, and fuel/flight time remaining (when equipped with fuel sensor(s)). Every avionics device has a display and a collection of buttons, keys, and knobs used to operate the unit. The display allows the device(s) to present information. The controls allow the pilot to enter information and program the avionics to accomplish the desired operations or tasks. The display and controls for a typical FMS are shown in Figure 3-2. Figure 3-2. FMS display and controls. FMS units contain much more information than they can present on the display at any one time. Information pertaining to some topics often extends beyond what can be presented on a single page. Page groups, or chapters, solve this problem by collecting all of the pages pertaining to the same topic. Each page presents information about a particular topic, and bears a page title reflecting its content. For example, the airport chapter may be divided into several airport pages, each page displaying different information about that airport. One page might be navaids. Another page might be the airport taxiway diagram. Yet another airport page might indicate available services and fixed-base operators. Review the documentation for that specific unit and installation to determine what information and levels of data are available and require updates. Usually, only one page can be displayed at a time. The airport page is displayed on the FMS in Figure 3-3. Figure 3-3 shows how to access pages and chapters on one manufacturer’s FMS. Different FMS units have different ways of allowing the pilot to switch between chapters and pages, and different ways of informing the pilot which chapter and page is currently displayed. To enter data, you use the FMS buttons (keyboard or individual) and knob controls, or a data source, such as disk media or keypad, as shown in Figure 3-4. Figure 3-4. 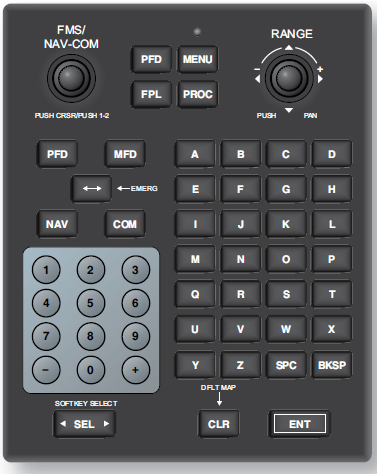 An FMS keypad. 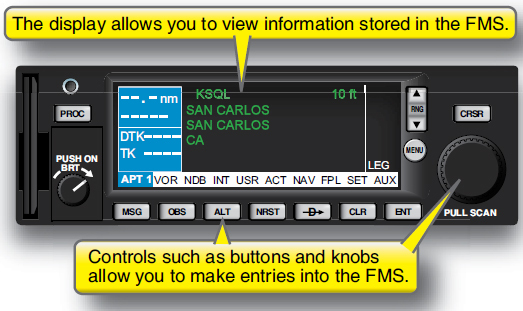 FMS units that do not feature keypads typically require the pilot to make entries using the same knobs to move among chapters and pages. In this case, the knobs have multiple purposes and, thus, have different modes of operation. To use the knobs for data entry, you must first activate what some manufacturers call the “cursor” (or “data entry”) mode. Activating the cursor mode allows you to enter data by turning the knob. In other units, after activating the data entry mode, entries are made by pushing buttons. Figure 3-5 illustrates the use of cursor mode to enter the name of an airport using one FMS. Pressing the inner knob engages cursor mode. A flashing cursor appears over one of the items on the page, indicating that it is ready for editing. Then, the inner knob is used to dial letters and numbers; the outer knob is used to move the flashing cursor between items on the page. Figure 3-5. Making entries using cursor mode. 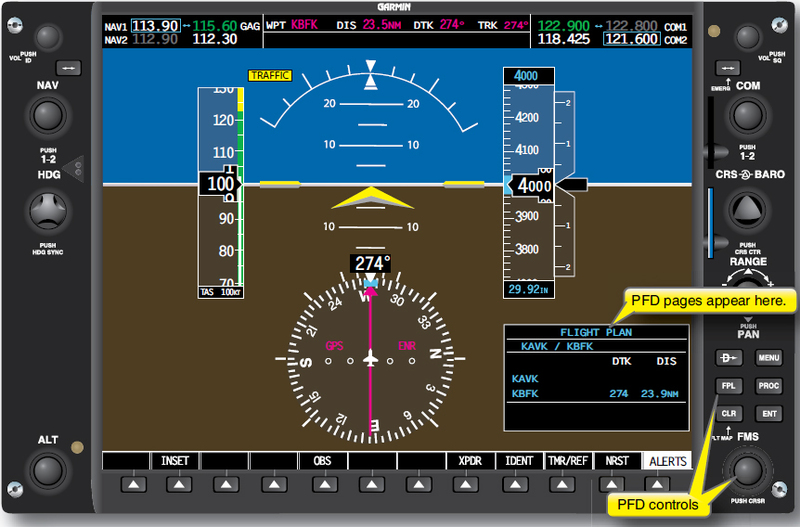 Some systems integrate FMS/RNAV display and controls into existing cockpit displays usually called PFDs and MFDs. In this case, there is no separate display to point to and call the RNAV display. 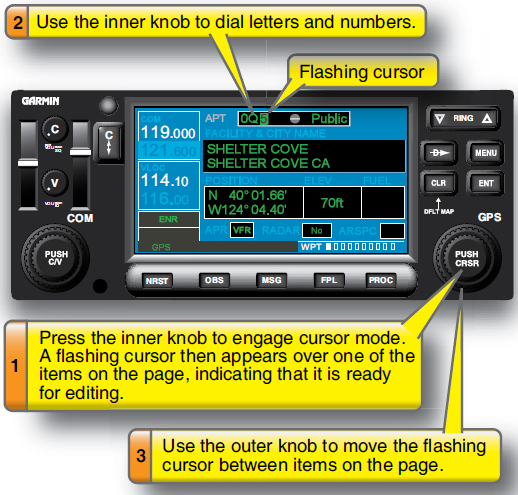 Figure 3-6 shows a system that uses the PFD to provide controls and a display for the FMS. This type of system utilizes the same concepts and procedures described above to access and enter into the navigation computer. Figure 3-6. An integrated avionics system. Avionics simulators can assist the pilot in developing proficiency in the advanced cockpit. Some manufacturers offer computer-based simulators that run on a personal computer and let the pilot learn how the unit organizes and presents information, as well as practice the buttonpushing and knob-twisting procedures needed to access and enter data. One very important function that every pilot of programmable avionics should learn and remember is how to cancel entries and functions. Turbulent flight conditions make data entry errors very easy to make. Every pilot should know how to revert quickly to the basic aircraft controls and functions to effect recovery in times of extreme stress. These programs are extremely useful not only for initial learning, but also for maintaining proficiency. For more sophisticated training, many manufacturers of flight simulators and flight training devices are now developing devices with advanced cockpit systems. These training platforms allow the pilot to work through realistic flying scenarios that teach not only the operating procedures required for each system, but also how to use the systems most effectively.